Sheer Voile drapes help create stunning settings when paired with uplighting, amazing wedding canopies, and breathtaking pipe and drape backdrops! 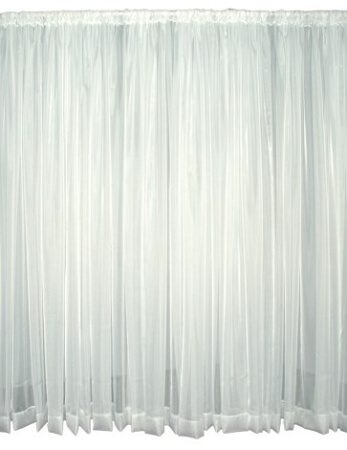 Each drape measures 146 inches tall x 118 inches wide. Material has natural edges that are not serged or hemmed. The drape is sewn 2 inches taller than 12 feet so that a couple of inches pool on the floor when used at a 12 foot height. I ordered these to hang from a high tension wire (as room dividing curtains in my studio.) They look amazing, I paired them with a solid white curtain from here as well. If I could give them 6+ stars I would. The quality, customer service and shipping all exceeded my expectations. Weight (Approximate, Each): 1 lb. 3 oz.